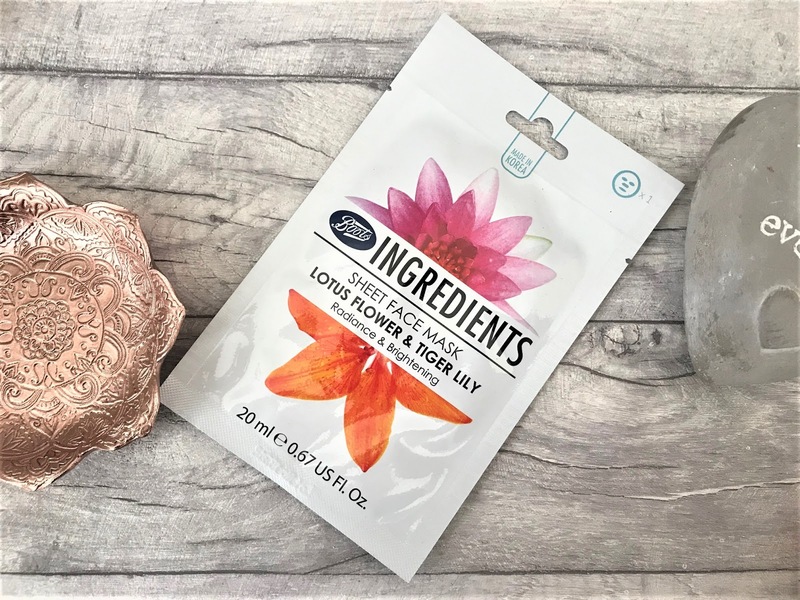 Throughout the last couple of months, I have had colds, sore throats and bad coughs, and along with that and the freezing cold weather, my skin has been in much need of some tender loving care. 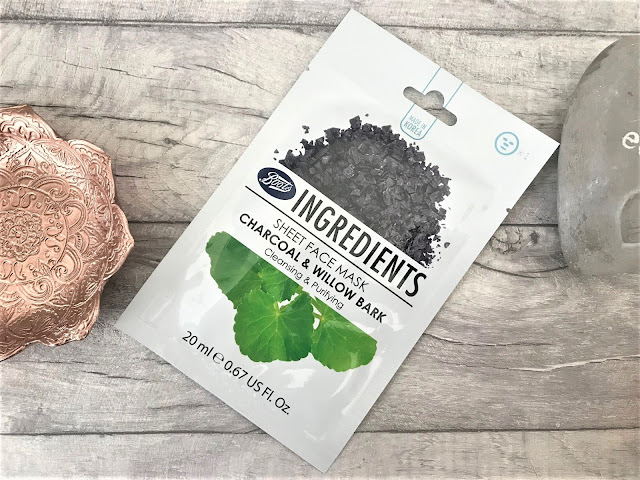 On a recent trip to Boots I discovered the Boots Ingredients Sheet Face Masks were on offer and as I had some Boots Points on my card, I thought it was about time I gave my skin a freshen up. When it comes to skincare, I have a pretty good daily routine down, and 9 times out of ten I manage to stick to it. The Boots Ingredients Sheet Face Masks are regularly £2.50 which I find decent value, but they had an offer on where if you bought one mask, you could get another for half price, costing just £1.25. There are five masks in the collection, and I picked up four of those due to the offer. 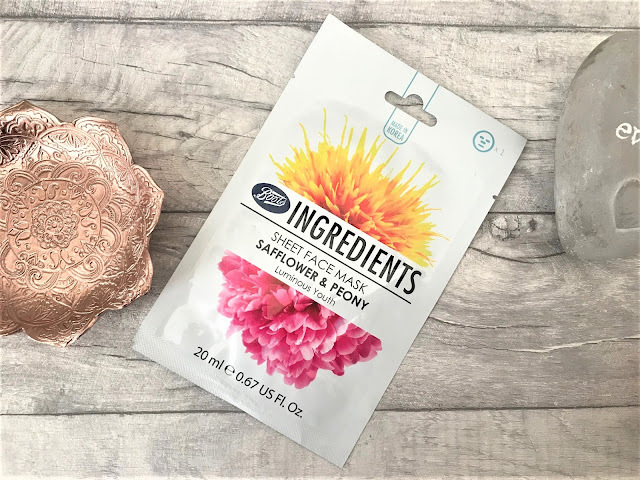 Firstly, there is Safflower & Peony which has been enriched with the floral extract of Safflower and Peony to leave your skin looking and feeling more youthful. The essence of the mask has been formulated to improve the skin's tone and texture and to give it a flawless look and feel. This is more of an anti-ageing mask, so I wouldn't recommend for those of you who are early twenties and younger. Next, we have the Boots Ingredients Charcoal & Willow Bark Sheet Face Mask which has been created to cleanse and purify the skin. Sheet masks are super easy to use, you simply pop the sheet mask over your face and then wait 15 minutes before taking them off. I always advise that when it comes to skincare, try leaving it on a little longer than the minimum advised time so that your skin can reap the benefits. This mask would be especially great for those who have quite oily, congested skin. We then have the Boots Ingredients Lotus Flower & Tiger Lily Sheet Face Mask to promote radiance and brighten the skin. This refreshing mask is enriched with floral extracts of Lotus Flower and Tiger Lily to help leave your skin radiant and looking brighter in just 15 minutes. If you have quite dull skin, which I do get especially at this time of year, then the Lotus Flower & Tiger Lily mask is the one for you. The final mask I have here is the Boots Ingredients Rooibos Sheet Face Mask for energising and revitalising the skin. 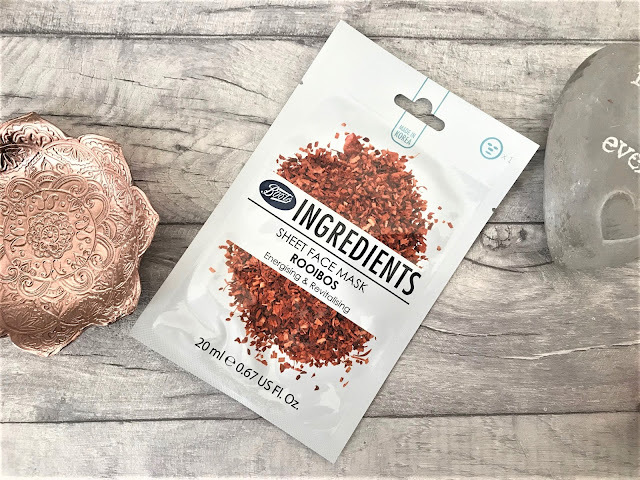 Rooibos is a tea which contains high levels of Vitamin C along with powerful antioxidants such as aspalathin which offer extensive health benefits, making this particular face mask great for rebooting the skin leaving it feeling and looking much more revitalised. 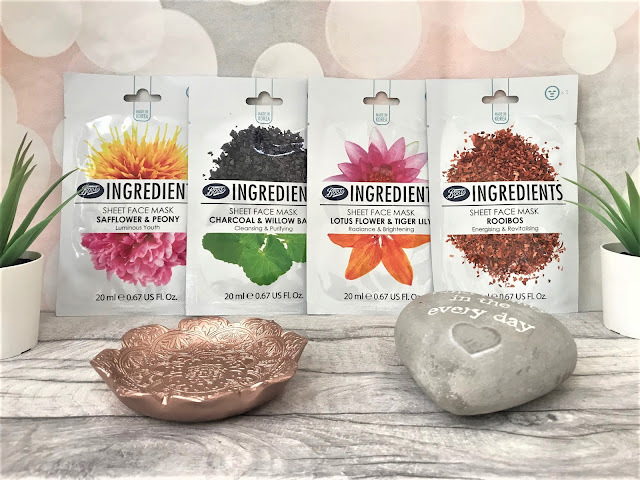 The Boots Ingredients Sheet Face Mask range can be found in-store or online at Boots.